It’s no secret that chalkboard anything is totally in style right now. For this tutorial, you’ll need Photoshop or Photoshop Elements and some basic photoshop knowledge. 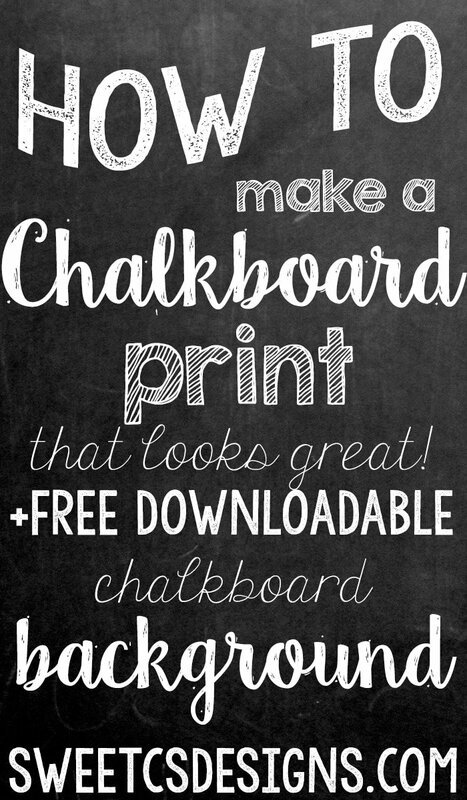 Be sure to check out the downloadables I am including at the bottom of the post for both my chalkboard background and the texture overlay I am using. If you don’t have Photoshop, don’t worry. You can still get an awesome chalk look! Head on over to my girl Kellie from Nest of Posies fabulous blog for an awesome tutorial and some wonderful font choices! First off, open up a chalkboard background (or set a size image you’d like to make and place the chalkboard image as the background). 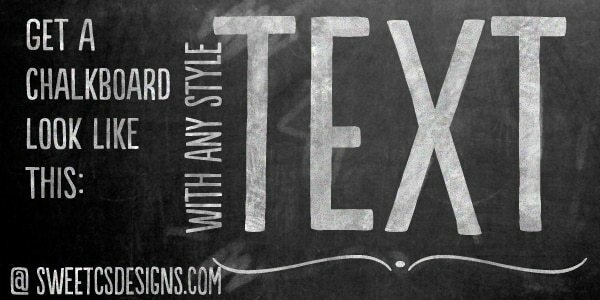 Next, pick a font (styles with a chalk look are easier, but any style font can be used with this method) and type out your text. 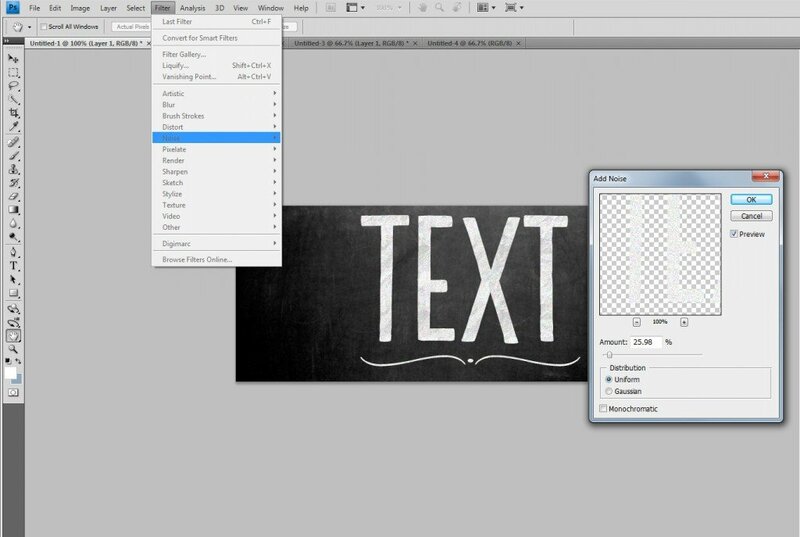 Next, you’ll add a textured overlay to your text. To do this, click “layer”, then “layer style” and “pattern overlay”. Choose the crumpled paper (download below), or a parchment styled look. Set the opacity to something very light- it will depend on your font, but you’ll generally want something that you can just see a little- under 30 usually does it. Now we’re going to add a little noise to make the text look a little grainy. You’ll need to rasterize your layer (right click on it and chose “rasterize”- you will not be able to change the text anymore after this), and then click “Filter”, “Noise” and “add noise. Again, this will depend on your individual font, but generally an amount under 30 will look best. I chose uniform distribution and did not choose monochromatic noise- but you can play around with all of the choices to see what you like best and what works the best for your font choices. We’re now going to add a little more texture to the font to make it look more like individual brush (or chalk) strokes. Pick an eraser brush that looks like dots, or even an eraser. You can download the one I am using here. Set the eraser opacity to under 30% (yep- again- it’s a trend here), and swipe through your text in different places. Keep swiping until you get a texture you like. I will usually use the eraser more in some areas and less in others just so it looks hand done and not uniform. Starting to like the way this looks? We’re almost there! To finish it all up, I like to add some swipes to the background (like an eraser went over it) and even more texture on the font. To do this, I set the paintbrush to white (or your chalk color), keep the spackled dots brush, and set the opacity to under 30%. 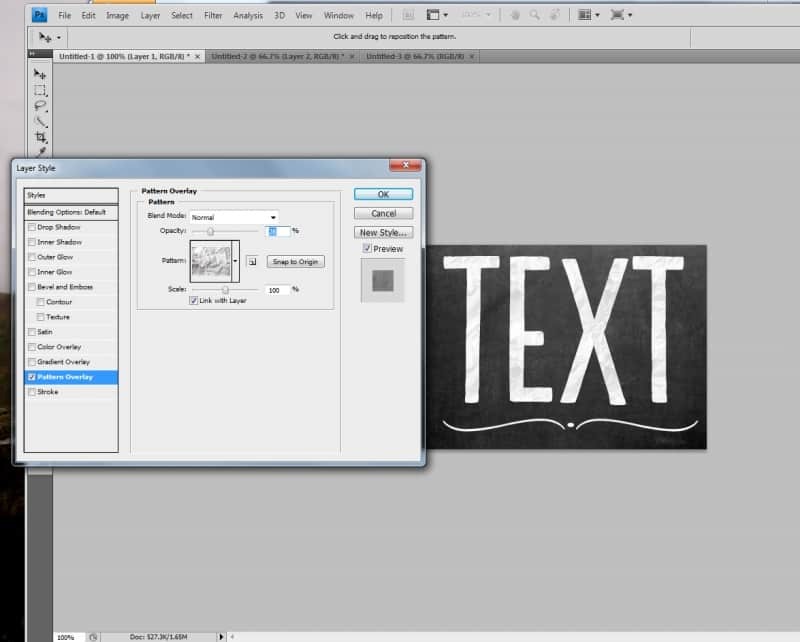 Swipe around the background, over letters- anywhere you want a little more texture. Reduce and increase the opacity and the brush size as you go for even more of a hand-done feel. 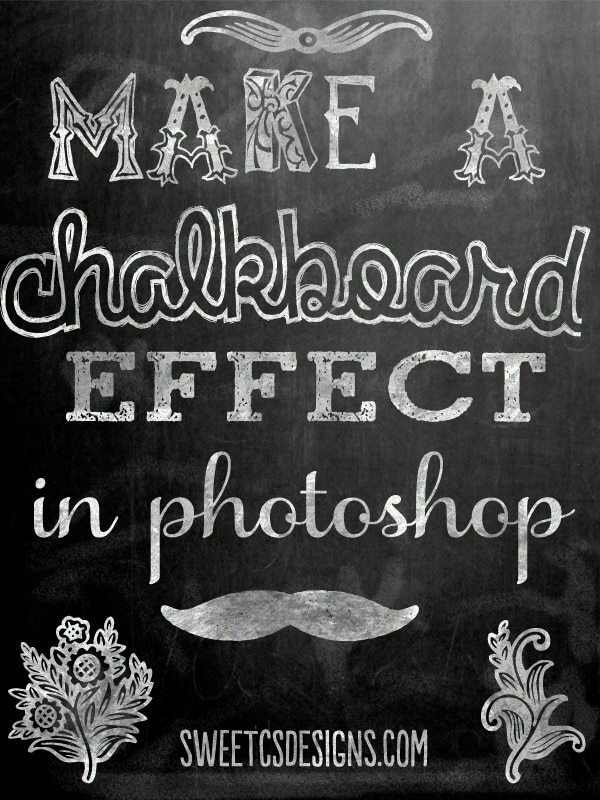 Now, the white swashes below are a little dramatic, but it is a good example of how you can use different brushes to add different looks to your “chalkboard”. 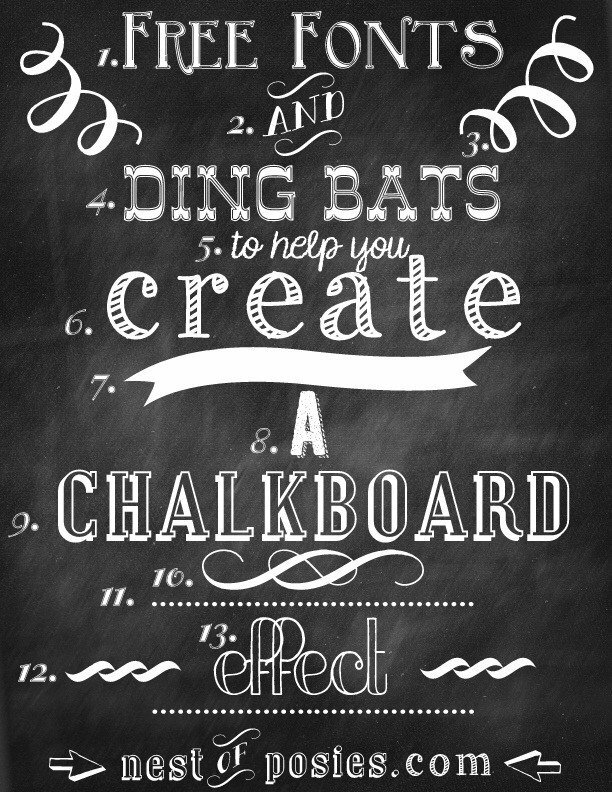 What would you want to make a chalkboard image of? And here is the texture overlay I am using. 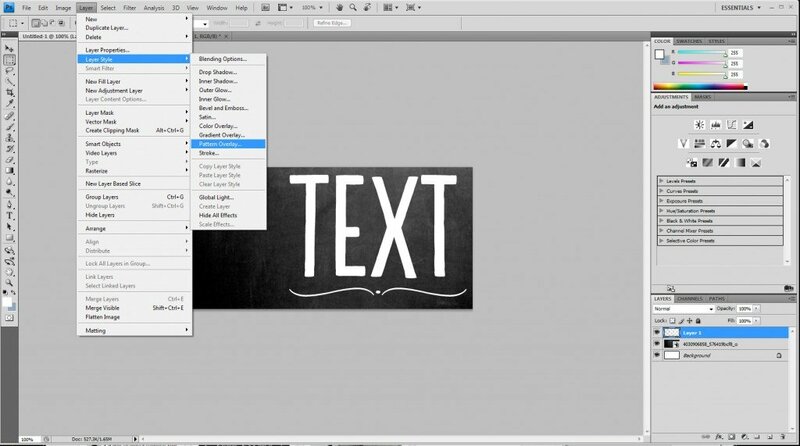 To set it as a pattern, open the file in photoshop and then click “Edit”, “Set as Pattern”. You’ll then see it in your dropdown pattern menu! CS5 users– try these other file extensions if the above doesn’t work– Download crumpled paper TIF or Download Crumpled paper PNG. 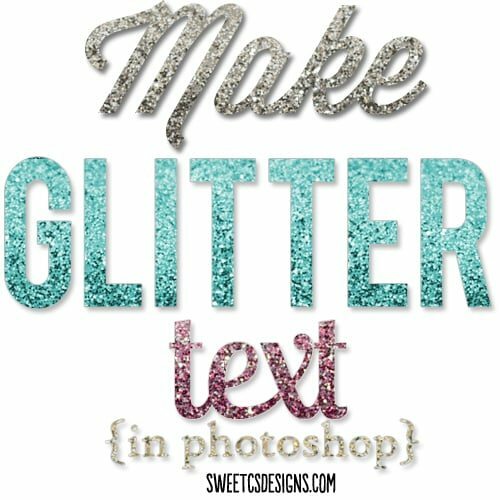 If you loved making chalk text, don’t miss my tutorial on making glitter text in Photoshop, here! 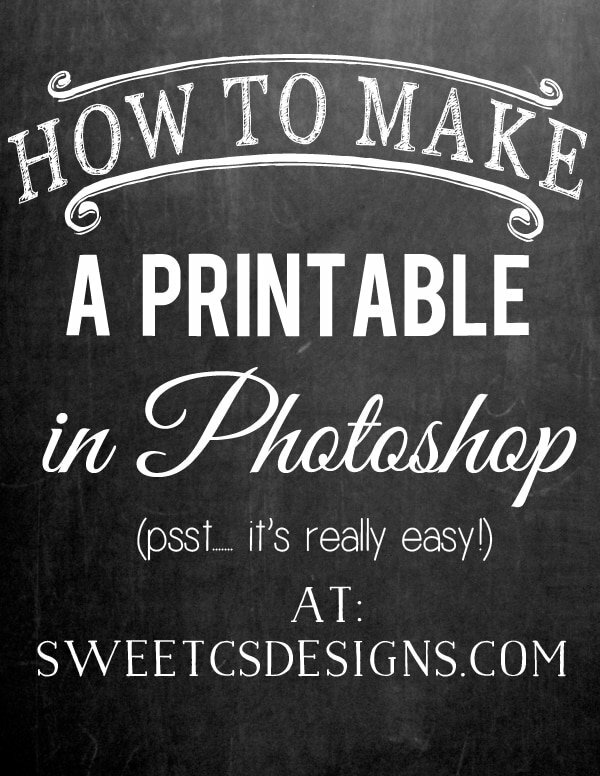 You can also learn how I use photoshop to make printables here! You can process the opacity as you need to view and can decreasing the opacity make watermark on the chalkboard, the tutorial is fine. 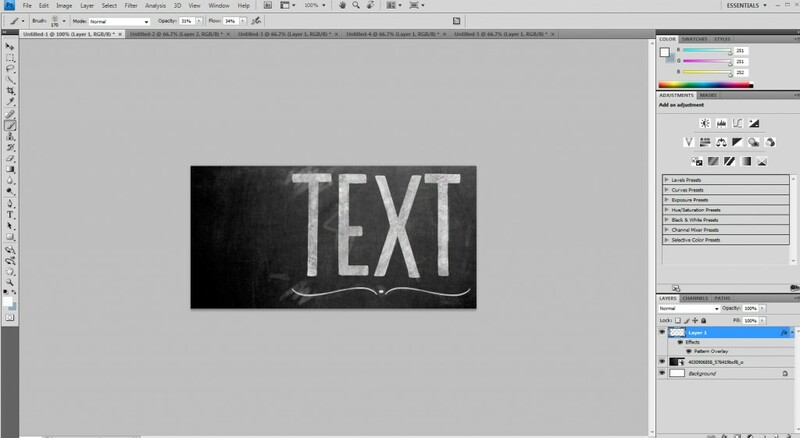 Thanks for sharing with us the chalkboard effect in photoshop. After a long time find out a great post. Great tutorial, I can’t wait to create! Good tutorial however a MAJOR step is missing. You have to “define” the paper pattern first, before you can use it as a pattern. Open your Wrinkled paper file (like you open any jpeg file in Photoshop so you can see it). Then select EDIT>Define Pattern. That will add the wrinkled paper to your available patterns. Then you can do this, click “layer”, then “layer style” and “pattern overlay”. Now the wrinkled paper will appear in your available pattern at the bottom of the available patterns. I was about to start searching for this important detail! Thanks! THANK YOU FOR POSTING THIS!! I noticed this was missing and didn’t know how to load the paper as a pattern. That you so much! I’m trying this for the first time. I’m using photoshop elements and am lost at step 1. How do I open the jpeg as a background? please help. Please don’t use the ‘Eraser’ Tool. Everyone should learn how to MASK. Erasing will destroy your pixels where Masking will simply hide. You can always UN-hide but you can not UN-Erase. Chad, you are spot on! I haven’t used the Eraser tool since discovering masking in the early 90x. In older versions of Photoshop Elements, masking required quite a few work-arounds, but I think they finally made it easier. Masking makes so many things easier. Love this tutorial so cute! I am using Elements and am having a hard time locating the layer, layer style, overlay. I go to layer and layer style but do not have the style overlay option. I am new to all of this and was wondering if you could help me out! 🙂 Thanks! You can choose “Layer” and then “New Fill Layer” then make sure to check the box that says “use previous layer to create a clipping mask”. Hope that helps! You are the best! You just saved me soooo much time today!!!! Seriously, I love you. 🙂 My project turned out so cute. I’ll try to post it on my blog so you can see. This is awesome tutorial. Thank you for sharing. Thank you. This was very helpful! Most appreciated. Awesome and exactly what our teams here wanted. I used it at the office and love your tutorial. You make teaching easy. I’m savvy with Photoshop. Your links were great. It’s all wonderful Huge thanks!! Thanks for the tips! I’m loving digital chalkboards at the mo’. There are a gazillion effects to try in Photoshop, aren’t there? You really could go on and on and on! Thanks so much for this! I tried it to make the front cover of a birthday card and it looks nice. I don’t seem to have a dots eraser tool and it does not appear in your article to download. Can someone respond and let me know a link to one. Thanks. I just wanted to say THANK YOU for this! 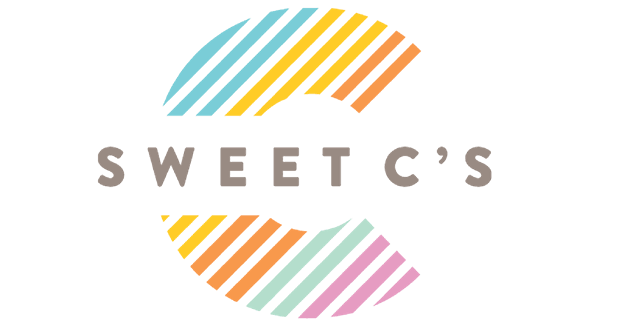 this is the closest I’ve come to finding something that works for a simple color image (a logo in 3-4 colors) that I wanted to convert to chalk. I’m a novice, but use PS a lot. But def not a true artist, so your tutorial helped a TON in my efforts to make a logo look chalky! THANKS! Courtney, help! I’m a PSE newbie. How can I adapt this to PSE? Thank you so much for taking the time to share this. I’m so grateful for wonderful people like you who impart their knowledge, creativity and talents on to the rest of us. Thank you again! Thanks for this excellent tutorial! I’m following to make 3×4 Project Life journaling cards. Thanks for sharing this tutorial! I am making a “love story” board for my sister’s wedding. I couldn’t get everything to work with my old PSE edition but I’m liking how it turned out. Thank you! This was very helpful, exactly what I was looking for tonight. Thanks for sharing. I can’t wait to try this out! This is a great tutorial! I was wanting some little extras to make the font really look like chalk and this did the trick! I had to do a work around on the pattern step because I use elements but it ended up with the same result! Thanks for the awsome tips! This worked so awesomely!!! I am saved! client wanted a poster with a chalkboard. ooookaaaay. wasn’t sure how to accomplish that but this tutorial saved me! now i have a killer chalkboard. now i need a frame for it. hmmm…. Thank you! Is there any way to add a little color to the text once it is rasterized? After I apply the pattern overlay, my color disappears. Kari, I will do the pattern overlay first, then the color. That should help! Also try setting your text the color you want first, then rasterize and pattern overlay. Make sure to set the pattern’s opacity pretty low and the color should still peek through. You might want a slightly darker color to begin with. there is another method but I’m currently writing a post on that! thanks for this tutorial… I could not find a link to the brush you used. I think mine is not working because I don’t have the proper brush? For CS6, you should be able to go to “edit” then click “define pattern.” Name it and then click ok. After that, it should be under your pattern overlay options. Just be sure you click to see all of your overlay options, rather than just the default. Thanks Heather for adding that. I have wanted to give that tip, but I don’t have cs6 (or the funds to get it right now) so I havent been able to verify the solutions I have found. Karlee, that is a great question! It was so long ago that I got it, I have absolutely no idea. Let me try to find a good one and I will post it! This is a really beautifully done tutorial. Thanks for sharing your knowledge! Thanks, Darci! Watch out- its addictive! 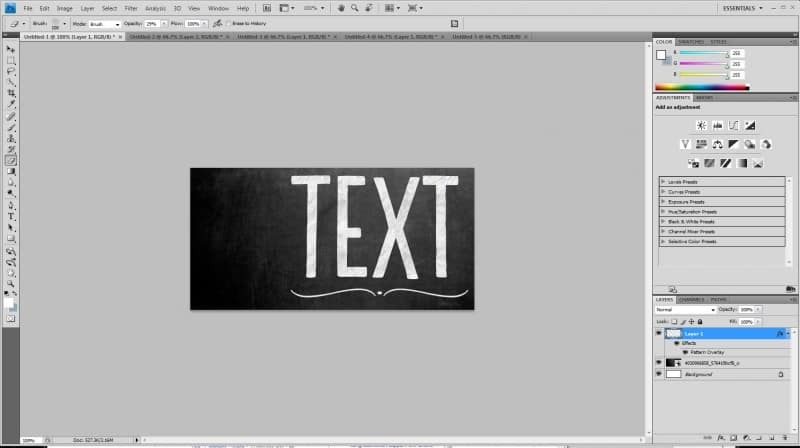 Thanks for the tutorial can I ask what font you used in the tutorial. I love finding new fonts so please feel free to ask anytime. I just used your tutorial and loved it! Thanks a lot! Oh I am glad you liked it! Isn’t it fun? Well written tutorial. I will be putting this to use in a design I have to do this week. Thanks for the tutorial, I can’t wait to give it a try. I want to make my Facebook cover image with a chalkboard effect. I just made my first chalkboard art and am thrilled with the results. Thanks so much for the tutorial! I had to make a few adjustments for PSE, but it was easy enough to figure out. Thanks for the tutorial! I used it to make a background for a photo booth I’m doing on New Years eve. Can you share how to get the “crumpled paper” into a pattern? Since its a jpeg file (i’m guessing that’s the problem since all other patter files are .pat files), my CS5 won’t allow it to be used as a pattern…? I have CS4, and instead of “set as pattern’ it says “define patter.’ After you get to the Pattern Overlay box remember to look for your saved pattern by clicking the down arrow next to the pattern that is already selected. A drop-box should appear with your saved pattern. I am having this same problem. Did you figure it out? This ended up working. Thanks Kyle! Thanks so much for the tutorial, I had a printable I was wanting to do this for, now I don’t have to figure it out for myself, hehe! Pinning and sharing!